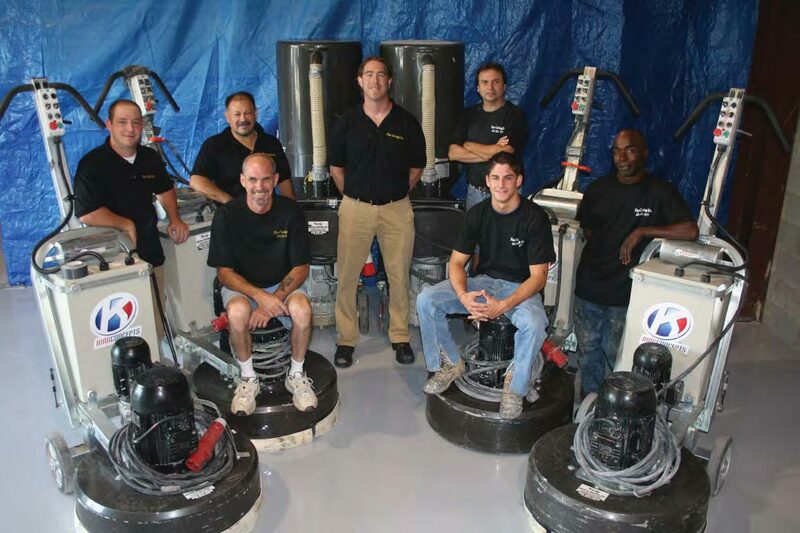 Planetary Diamond Grinder | Floor Coatings, Etc. This dustless, vacuumized diamond grinder equipped with various types of diamonds can almost surgically remove thin-film coatings, mastic, glue, tile mortar and heavy duty (thick) epoxy systems. The same piece properly equipped can also be used to polish concrete. We have eight (8) of these units in our arsenal. Estimating the amount of time required to remove paint, coatings, mastic, etc. is difficult at best. We prefer to do removal a week or more ahead of the proposed installation date. By doing this means the grinding can be done off hours usually causing the least interference to our customer’s business. We work when you’re not and the floor is available for your use when you need it. There’s little or no need for our customers to shut down for this process. This diamond grinder is being used after hours to remove an old failed coating. The cutomer was not required to shut down or move any of his equipment out of the building for THIS process. Conversely in the subsequent photos of the same shop everything is moved out for the shot blasting and material application which was performed over a 60 hour weekend. Click the image to the right to enlarge. 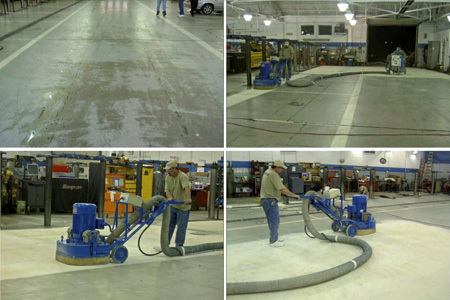 Floor Coatings Etc., Inc. is a 40 years old INSTALLER of resinous flooring systems. We manufacture our own materials for our own use. Copyright © 2017 Floor Coatings, Etc. | Powered by: Cyber-Construction, Inc.